Shaun Miller scores his second against Carlisle last season. Shaun Miller says it was a tough decision to swap Morecambe for Carlisle. Last season’s top scorer at the Globe Arena turned down the offer of a new contract with The Shrimps to sign a two-year deal with the Cumbrians. It is a move that sees Miller link up with Jamie Devitt, another Morecambe star man to have made the move to Brunton Park this summer. Miller told Carlisle’s official website he was impressed with the ambition shown by boss Keith Curle. 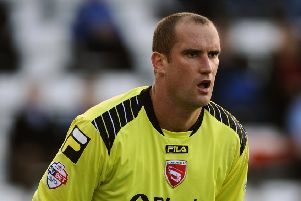 He said: “I had a really good time there (Morecambe) and it’s sad to be leaving in many respects. “It was never going to be completely easy to move away from that, but you have to consider your options and do what you think is best for yourself and your family at that time. “Last season was probably my best in the game so far, in terms of pitch time and goals scored, but this is a new challenge and it’s one I can’t wait for. “It’s another step I’ve taken with my career and a big part of that is because of the ambition I’ve seen within my new club. “That dangled an extra carrot because I want to be part of something successful. Miller, who also revealed he had other options on the table, put behind an injury-hit three years to star for The Shrimps last season including scoring twice in Jim Bentley’s side’s 3-2 win at Carlisle. It was an afternoon that also saw Devitt impress at Brunton Park and the former Crewe man is looking forward to keeping that partnership going. He said: “I had a smile on my face when I saw that he’d signed. “He’s a player I know well and we obviously had initial contact with each other once we knew we were both speaking to Carlisle. “We’ll both be moving up to the area and hopefully we’ll take the partnership we developed through our time with Morecambe onto the pitch with United. The pair won’t have to wait long for a return to the Globe Arena with Carlisle set to make the short trip south on October 8.